Create a scoreboard for sporting events such as baseball, basketball, football, volleyball, softball, soccer, hockey, and lacrosse. Add your organization's logo as a watermark. to your webcast or stream a slide show during breaks in the action. Webcasting your events is fast, easy, and affordable. And if you would like to see just how easy it can be, we are offering a free trial webcast. With the Event-Cast ios app for the iPhone, iPad, and iPod touch it's easy as 1-2-3. 2 - Select duration and maximum viewers. 3 - Tap on the Webcast button. Share a live webcast on Facebook, tweet a breaking event with a link to our viewer. Your events are meant to be shared. 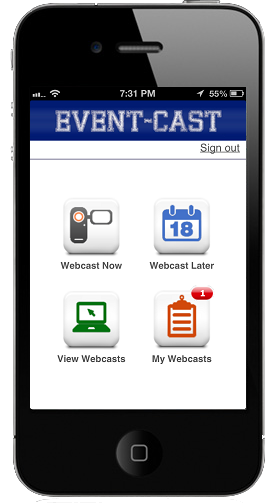 Event-Cast is the quickest and easiest way to webcast your special events with friends and family from compatible iOS devices (iPhones, iPads, iPod Touch). New! for 3.0 Add and position Sponsor Graphics for the webcast. New! for 3.0 Add a Slideshow of Photos to the webcast. New! for 3.0 Control the position of the Scoreboard in the webcast. New! for 3.0 Show a map of viewers who are viewing your webcast. New! for 2.9 Scoreboards are now embedded in the webcast for better synchronization. New! for 2.9 Improved sharing options from viewer . New! for 2.9 Improved zoom for ipad mini. New! New share button with a now option - text a link to your events. An event-cast.com account for scheduling your events. Schedule events at event-cast.com and click on the webcast link. wifi or 3g internet access. Refer to the pricing info page. Copyright 2017 Sports Internet Solutions LLC. All rights reserved.